Voilà! Suite à l'idée d'un lecteur, j'ai créé une page qui rassemble les liens à tous mes articles poussés sur le gong fu cha. Pour y accéder, vous pouvez aussi appuyer sur le lien dans la colonne de droite sous Gong Fu Cha. Je compte continuer à l'enrichir avec d'autres articles dans le futur. Je vois que ma partie 'théière' n'est pas encore très fournie, par exemple... Mais si vous aviez des idées de leçons sur des points précis que vous ne comprenez pas, faites-le moi savoir! Et n'oubliez pas qu'après la théorie, le mieux c'est de mettre le tout en pratique! Aspect des feuilles sèches: On peut d'abord regarder le thé dans son emballage. Couleur des feuilles sèches: Et on regarde le thé qu'on s'apprête à faire sur un la soucoupe ou dans une coupe de thé. Aspect des feuilles ouvertes: d'abord le tout dans le gaibei, puis, après la dernière infusion, on sort quelques feuilles qu'on place sur la soucoupe du gaibei ou sur le couvercle retourné. Les feuilles sèches: de la partie qu'on va préparer. Le couvercle: le dessous du couvercle du gaibei reçoit de nombreuses aromes. Les sentir permet de savoir quand l'infusion est prête. Mais on peut aussi le sentir quand le thé a été versé. Le thé: bizarrement, souvent moins aromatique que le couvercle ou le verre vide. Les feuilles de thé chaudes: après avoir vidé le gaibei. On sentira aussi le gaibei après avoir sorti les feuilles: si l'odeur est encore forte, cela veut dire que le thé aurait pu faire d'autres infusions. Le verre vide: il sert ainsi de wen xiang bei aussi! Ou bien la cruche vide! Persistance du moelleux: quelles transformations de goût y a-il dans le temps? Acidité/astringence: sur l'arrière et le côté de la langue. Dans la gorge: le thé est-il assez fort pour être ressenti jusque dans la gorge? Impression de sec: Quelle est l'impression finale du thé? Par-delà les sens, le thé est aussi un plaisir culturel, spirituel capable d'ouvrir les portes d'un grand nombre de disciplines. C'est ce que nous verrons la prochaine fois. 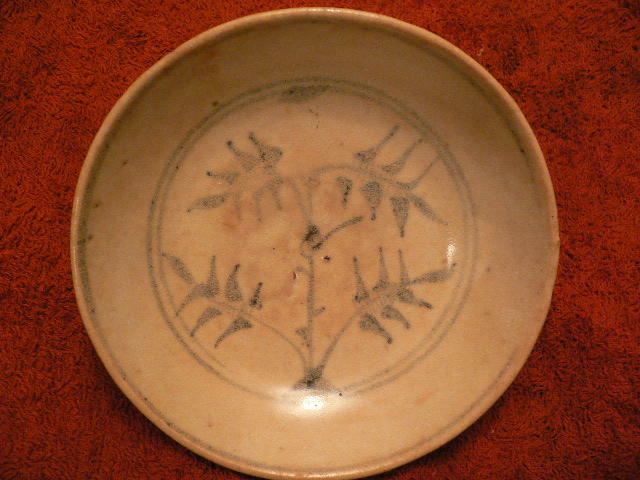 This is a good example: the leaves are evenly open in the gaibei. They fill all the space, and yet are not crammed. Each tea leaf has reached the same level of unfolding, which means they are all releasing the same aromas and tastes at the same time. After pouring the tea in the pitcher, the leaves lean on one side of the gaibei. 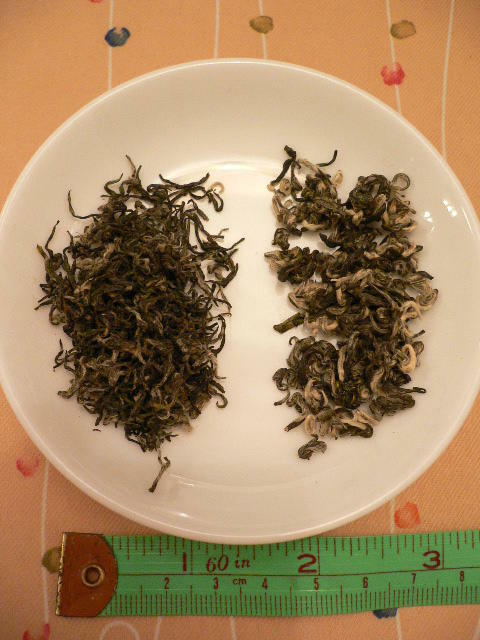 In the next brew, the leaves on the left can unfold quickly in their empty half of the gaiwan. The leaves against the wall won't unfold as quickly, which means these will release their flavors more slowly. The result will be a mix of tastes: the quickly unfolding leaves will start to release their astringency while the others have not released all their light flavors. Rule: The water flow must enable an even unfolding of all tea leaves. Let's come back now to the beginning and apply this rule on all our actions. 1. Put the leaves in the gaibei. 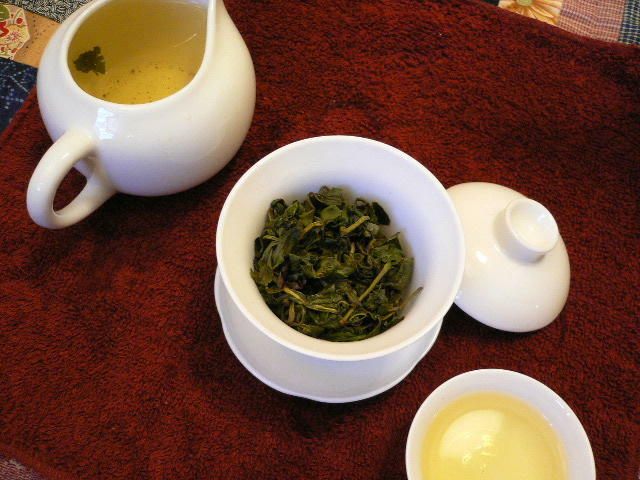 Here is an example for Oolong. The dry leaves must evenly cover the bottom of the gaibei. 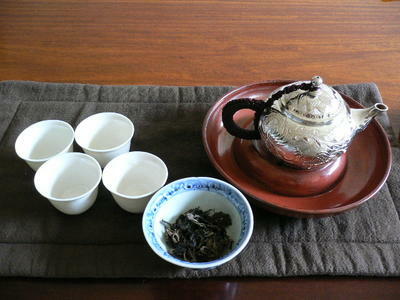 The ideal quantity (for oolong) is the one that gives a gaiwan full, but not crammed, with open leaves. Another rule is: the better the tea, the less you will use. For Baozhong, you first press it a little in your hand before putting the leaves in the gaibei. 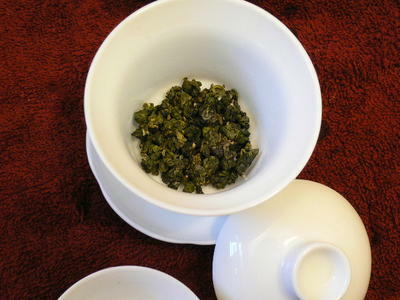 Fill half or more of the gaiwan with dry leaves. Note: I'm using my bare hands to take and put the tea in the gaiwan. Don't be shocked! My hands are clean, and the best tea leaves are picked and sorted by hand. This is also part of the 'chemistry', the sensual aspect, of what's happening between you and the tea leaves. Tea leaves are very sensitive and easily pick outside odors. So, while it's OK that the brewer touches them, the guests should only be allowed to look and smell them. Except old teas and cooked pu-erh, I never rinse the tea beforehand. Nobody is doing it for tea bags, even though most of them are of much lower quality! Tea is processed at over 100 degrees Celcius and therefore I consider it sufficiently clean. Especially, I don't want to waste a drop of the wonderful aromas! Water has just boiled. We take the water pot and bring it closer to the gaiwan. We pause a moment to let the water calm down, so that we can better control its flow. 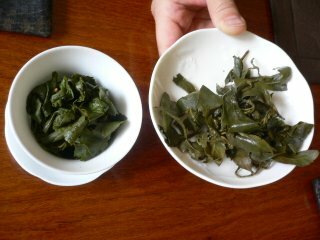 The way we pour the hot water in the gaiwan depends on the kind of leaves we are brewing. Let's dance! This video will show better than a thousand words how to brew oolong. This tea needs a lot of energy to open up its curled leaves. The circular movement will stop when all leaves are equidistant, resulting in a perfect balance. Pour water directly on all the leaves, almost up to the top of the gaiwan. Use the lid to take the foam away. 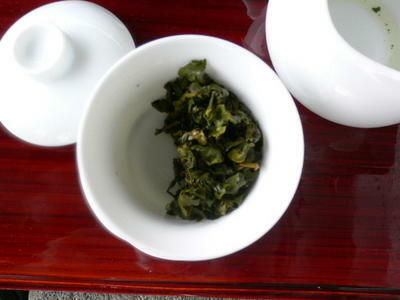 Lightly oxidized, baozhong can take the direct heat on its leaves. 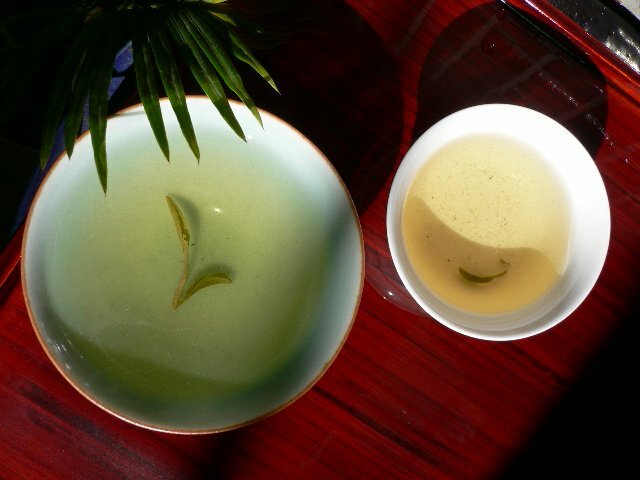 Slowly pour the water on the wall of the gaibei, thereby avoiding a direct contact between the hot water and the fragile green tea leaves. This strong tea can also take a direct hit on its leaves. Should there be foam, also take it away with the lid. The water flow should be neither too strong, neither too slow. Once open, the tea leaves don't need that much strength to release their flavors. 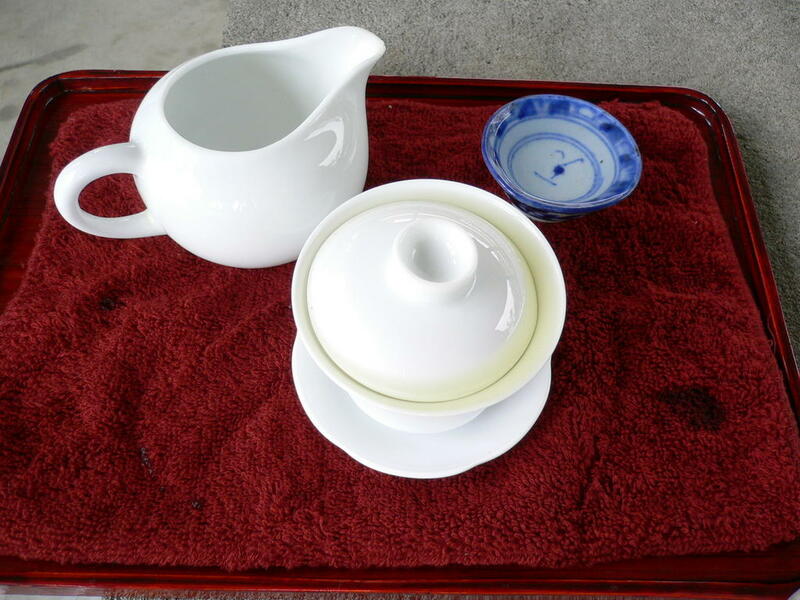 For the following brews, we pour the water slowly and in an even manner all around the gaiwan. We keep your body and mind calm during this step. Our goal remains to reach all leaves with the same strength so that they release the same flavors. 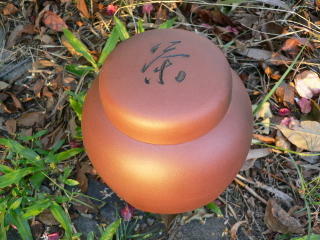 If the leaves are plenty, we can also take the lid and use it give the leaves space to unfold. 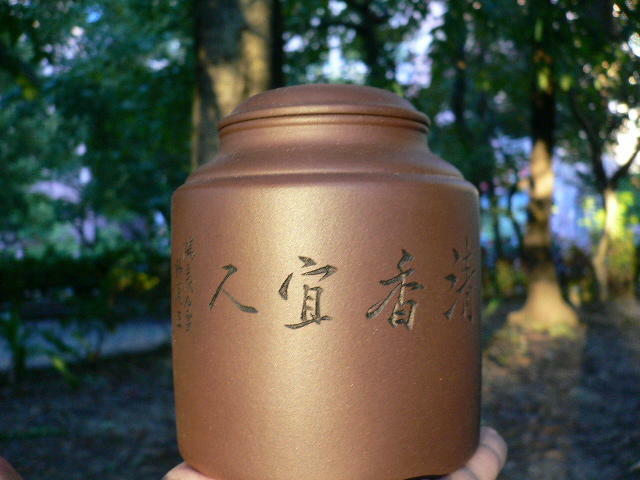 In case the leaves loose much temperature between two brews, we will pour the water with more strength, from higher above the gaibei, to waken them up. 4. When do you pour the tea out? 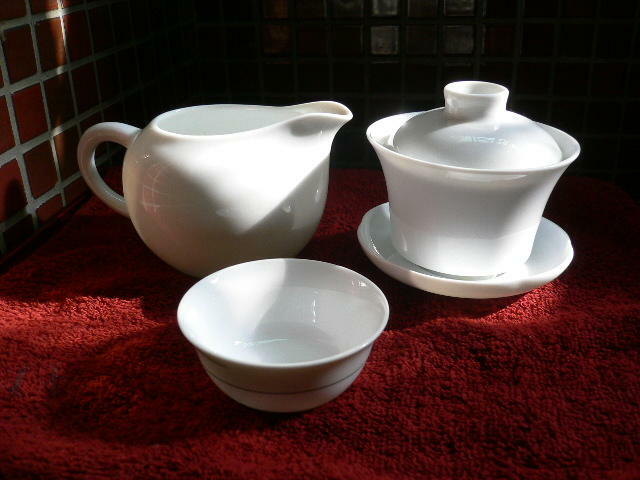 Using a white porcelain will let you see more easily when the water starts to turn darker with tea. 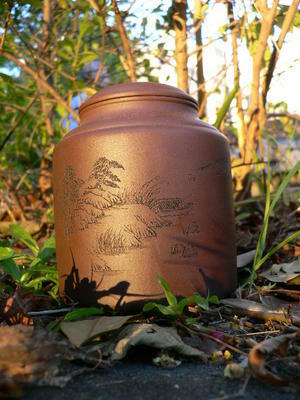 You can also take the lid and smell its bottom to verify that the smells have been released. In theory, the first brew takes longer than the second and the following ones will steep longer and longer. Besides, steep time may also be a matter of personal preference for light or strong tea. Rule: The better the tea, the longer it can steep. 5. How do you pour the tea from the gaibei into the strainer (or directly in the cups)? - Pour the tea quickly in the strainer, and you'll obtain a tea with floral notes. (Recommended for baozhong, jinshuan oolong, green tea in general). - Pour the tea slowly (but continuously) and the tea will have more yun, longer aftertaste. (Good for luanze oolong, old teas and fine vintage puer). 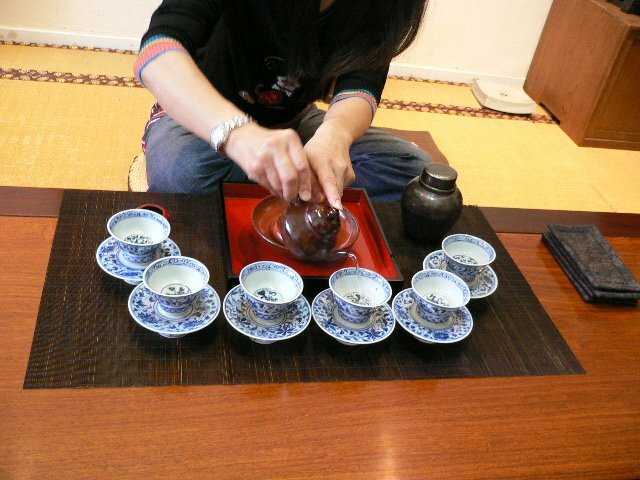 Whatever speed you pour, try to move the gaibei progressively to keep the tea leaves nicely together. When you eventually pour the tea in the cups, take into account that the last drops coming out of the gaibei or strainer are more concentrated than the first. Therefore, don't fill one cup after another, but fill them in several rounds. In the next lesson, I will show different ways to appretiate the tea during the gongfu cha. Ouf! Les 4 vidéos de 4 façons d'infuser le thé sont enfin prêtes. La plus jolie est sans aucun doute celle de la danse du Oolong! 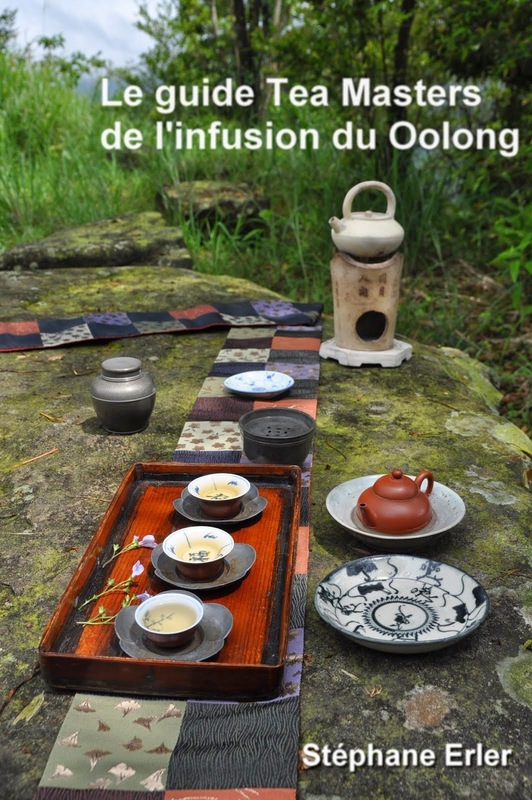 Allez voir dans l'article Apprendre le gongfu cha (4) un peu plus bas! Update: J'en ai rajouté une cinquième pour montrer comment verser le thé hors du gaibei. Pour ne pas vous bruler: tenez bien le bord avec les doigts (et non les parois), et entrainez-vous souvent! The tools are all set and the ingedients are ready. It's now time to start the gongfu cha with a very important first step: preheating your equipment. See this video. First, you pour hot water in the gaibei, then the pitcher and the cup. This water than ends up in the little waste bowl. The preheating time will depend upon the thickness of the porcelain. 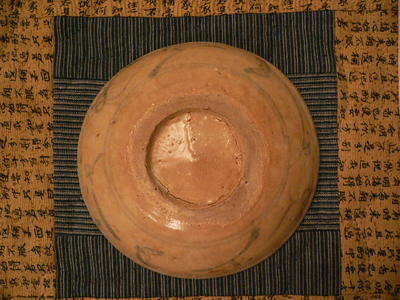 The video shows a quick way to heat the lid of the gaiwan. Preheating is an essential step of gongfu cha. The higher the temperature in the gaibei, the more flavors the tea leaves release. A tea made without preheating of the vessel will taste closed, muted. During my first tea lessons with Teaparker, the most common mistake we students used to make was an incomplete or insufficient pereheating. It's so important that you may sometimes want to warm your pitcher and cup again between two distant brewings. This step is specific to gongfu cha and also applies if you're using a small of big teapot. 1. 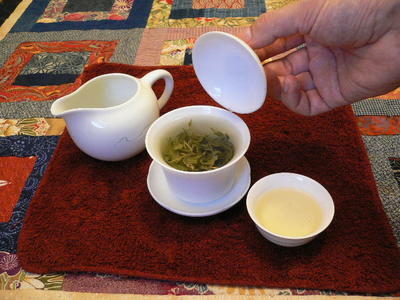 Tea: any tea can be prepared with the gongfu cha method. 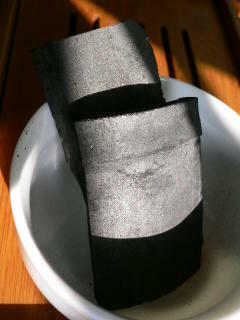 Of course, fine Chinese whole leave teas are perfect for gongfu cha, but you could even use a plain tea bag! 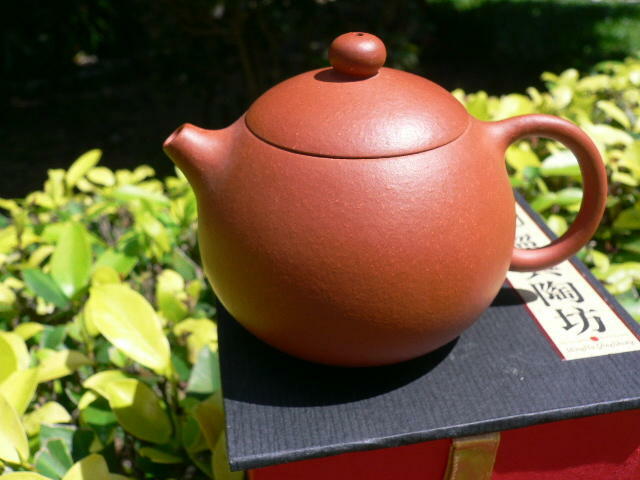 The goal of gongfu cha is, for a given tea, to find the best parameters to brew the best possible cup of tea with it. 2. Water: Tea is 99% water. So you better choose your water very carefully. A good way to start learning about tea is to blind test several waters (mineral, purified, tap...) you consider using for your tea. Find out by yourself which one slips most easily down your mouth and has a mellow, but neutral taste. 3. Fire: Heat lets the leaves release their flavors faster. A 100 degree Celcius brewed tea will release twice as many molecules as when brewed at 80 degrees C. That's the reason why Lu yu and Teaparker recommend to always use water that has reached the boiling point for a short period of time. Best is to cook the water at medium speed in order to catch the right moment, when the bubbles have the size of crab eyes. An overboiled water will taste 'old' and loose its freshness. If this should happen, add fresh water to the overcooked water and boil more carefully again. The subject keeps on coming up in mails and discussion groups about tea. Almost each tea web site proposes its slightly different version of how to make Chinese tea. Some give good advice, but there are always mistakes or inaccuracies and none seems to go as far as what I have learned from tea master Teaparker. So, I'll share what I've learned in a series of several lessons. These are more guidelines than a standard procedure and they should give you enough basic knowledge to let you make educated experiments by yourself. Because it's not enough that I (or Teaparker) tells you this is the best way to make tea, most importantly YOU must feel the difference. First, what are the most basic tools we need to brew Chinese tea? 3. 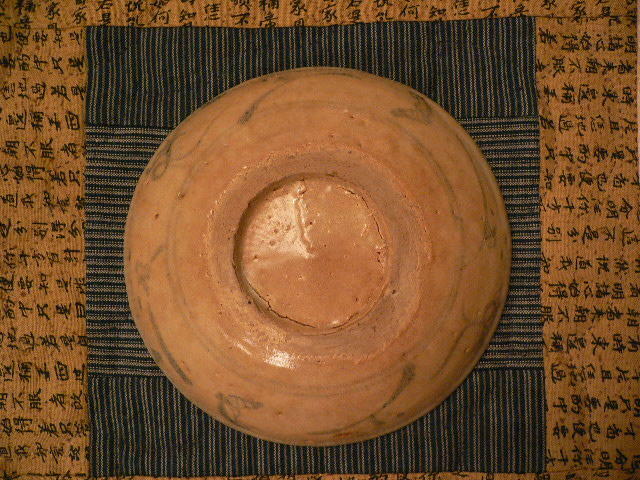 A pitcher or strainer to empty the tea from the gaibei. 4. 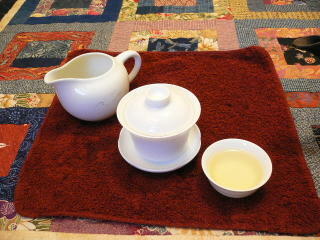 A water absorbing towel below all the above: tea brewing can quickly look quite messy with water everywhere. The towel is the low cost solution to keep everything neat and your mind in peace. The gaiwan, cup and pitcher must all be made of glazed porcelain instead of glass or clay. Why? Porcelain is neutral while unglazed clay will modify the taste of tea. All serious tea competitions and professionals use porcelain. They are usually plain white, but motives on the outside are not a problem. I also recommend rather thin walls, as such walls let delicate flavors express themselves better. But it's not a must. Thicker walls, on the other hand, may be more resistant to shocks. You'll also need 2 other items not shown here: a hot water pot on a source of energy (wood, gas, electricity) and a trash can for water and used tea leaves. 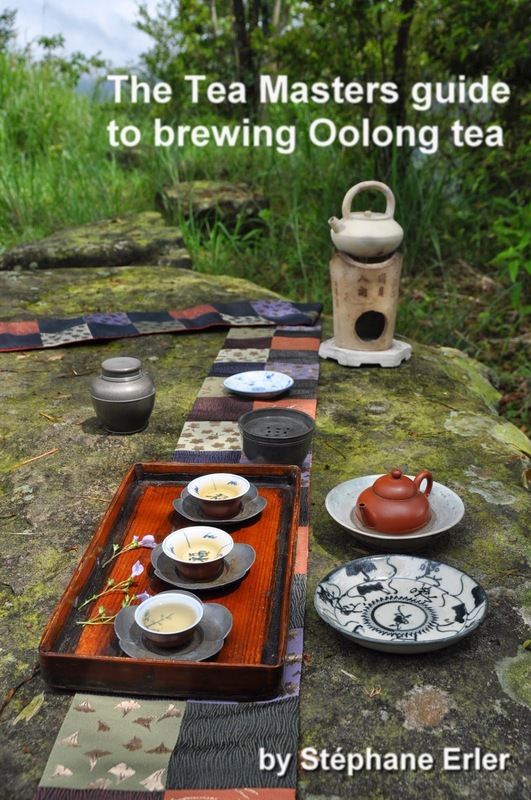 I had a great time brewing several oolongs and baozhongs on top of a mountain in Nankang, next to the Guang Min Temple. The location explains the presence of this (and 5 other) peaceful statue. 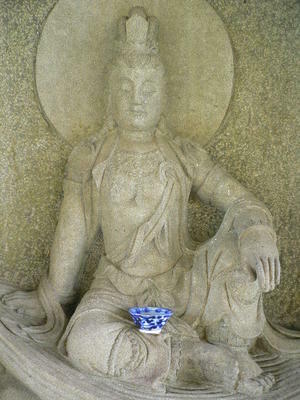 I had come alone, and rain had scared off the usual visitors, so I ended sharing a cup of tea with the statue. 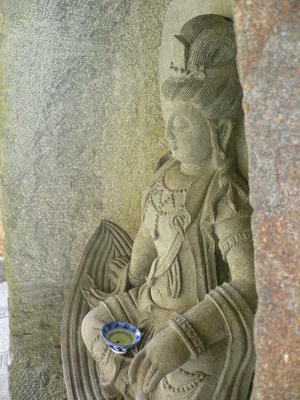 I wish I could meditate and enjoy the tea as she does. Cool! La leçon que vous lisez va bien plus loin que ce vous pouvez trouvez sur Wikipédia et les liens externes. Même dans la version en anglais et le lien le plus cité, on ne trouve qu'une description de la cérémonie vue de l'extérieur, mais sans explication sur ce qui se passe dans le gaibei. Cela vous évitera de vous inscrire. Merci de faire log out rapidement après avoir vu les petits films de manière à ce que d'autres puissent aussi les voir. Voici un bon exemple d'une infusion réussie: les feuilles de thé se sont ouvertes harmonieusement dans le gaibei et occupent toute la place sans être top serrées non plus. Chaque feuille est donc au même stade de l'infusion et donne d'elle les mêmes saveurs que ses voisines dans le gaibei. Après déversement du thé dans la cruche, les feuilles n'occupent que la moitié du gaibei. Les feuilles de gauche qui ont de la place vont infuser plus rapidement que celles collées contre la paroi. On obtiendra un mélange de goûts: les feuilles qui ont eu de la place vont se mettre à diffuser des tanins, alors que les serrées n'auront pas encore donné tous leurs jolis aromes. Principe à retenir: Le flux de l'eau doit permettre un développement harmonieux et coordonné de toutes les feuilles de thé. 1. Mettre les feuilles dans le gaibei. Voici un exemple pour le oolong. Les feuilles doivent recouvrir tout le fond du gaibei. La quantité idéale est celle qui donne, à la fin, un gaibei rempli de feuilles, mais sans excès. De plus, meilleur le thé, moins de feuilles on emploie. Pour le baozhong, on serre un peu les feuilles dans sa main avant de les mettre dans le gaibei, jusqu'à une bonne moitié. Vous observerez que j'utilise mes mains pour prendre et verser le thé dans le zhong. Ne soyez pas choqué! J'ai préalablement lavé mes mains! De plus les meilleures feuilles de thé ont été cueillies et triées à la main. Cela fait aussi parti du rapport sensuel entre le thé et celui qui l'infuse. Une osmose se crée entre vous et le thé. Un contact direct est donc normal. Les spectateurs (et buveurs) eux, n'ont pas le droit de toucher le thé, juste de le sentir. Mis à part les vieux thés et les pu erh cuits, nous ne faisons pas de rinçage du thé. Sa fabrication à plus de 100 degrés en fait un produit tout à fait propre et hygiénique. Et nous ne voulons pas perdre une goutte d'aromes! L'eau vient donc de bouillir. Nous prenons la bouilloire et l'approchons du gaiwan. Nous faisons une petite pause pour que l'eau qui bouge sous l'effet du mouvement se calme, et jusqu'à ce que le frémissement de l'eau s'arrête. Le geste de la première infusion va dépendre de la sorte de thé que nous faisons et de sa résistance à la chaleur. Faire danser le Oolong. Cette vidéo montrera mieux que mille paroles comment infuser le oolong. Celui-ci a besoin de beaucoup d'énergie car ses feuilles sont recroquevillées. Verser l'eau directement sur les feuilles de baozhong et presque jusqu'à rebord. Cela fera naitre une écume qu'on enlève avec le couvercle. Un peu fermenté, le baozhong supporte l'eau directe sur ses feuilles. Verser l'eau doucement sur le bord du gaibei sans toucher directement ses feuilles fragiles. Thé costaud. Débit ni trop rapide ni trop lent direct sur les feuilles. Ecumer si nécessaire. Une fois ouvertes, les feuilles n'ont plus besoin de tellement de force. On versera alors l'eau lentement, avec un débit plutôt lent sur le pourtour du gaibei, toujours pour obtenir une infusion harmonieuse et équilibrée. On peut aussi prendre le couvercle pour aider les feuilles à s'ouvrir également. Au cas où les feuilles se sont refroidies entre deux infusions, on peut verser d'un peu plus haut, toujours en rond, afin de les réveiller. On peut vérifier à la vue que la couleur du thé devient suffisamment foncé, et/ou on peut sentir le dessous du couvercle pour savoir si les aromes sont présents. En théorie, on rallongera progressivement la durée de chaque infusion successive. La durée dépend alors aussi de vos préférences personnelles: thé léger ou concentré. Un autre principe: meilleure est la qualité des feuilles, plus on peut les laisser infuser. 5. Comment verser le thé du gaibei dans la cruches (ou les tasses)? - Rapidement, et on obtient un thé riche en aromes fleuris. (Bon pour le baozhong, le jinshuan oolong, le thé vert en général). - Lentement, et on obtient un thé avec plus de yun, de longueur en bouche. 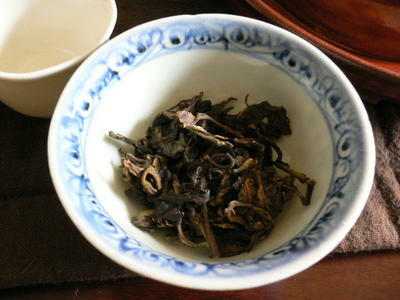 (Bon pour le luanze oolong, les vieux puers et vieux thés). Quelle que soit la vitesse, il faut essayer de pencher le gaibei progressivement afin que les feuilles ne penchent pas toutes d'un côté à la fin. Lorsqu'on verse dans les tasses, il faut tenir compte que certaines molécules lourdes descendent dans la cruche. Il ne faut donc pas remplir une tasse après l'autre, mais en plusieurs fois (si vous êtes plusieurs). Dans la prochaine leçon, nous discuterons des différentes façons d'apprécier le thé. Pour les amoureux de la langue française, voici une définition bien complète et fort juste. J'aime bien leur troisième alinéa: "Boisson préparée par infusion de ces feuilles dans l'eau frémissante (...)". Remplacez "frémissante" par "qui vient de frémir" et c'est parfait, même si cela sonne moins bien. Pas bête ce dico! Il en sait plus que tous les manipulateurs de thermomètre. But it's not just the size, shape and price that's different (the smaller, the more expensive). The bigger leave Bi Luo Chun is very fragrant, much more than the smaller one, but it's flat in the mouth. On the other hand the small buds Bi Luo Chun display a powerful, yet delicate, yun in the mouth and throat. Amazing to see such different characteristics from the same kind of tea. Conclusion? A nice fragrance will give you a high grade Bi Luo Chun, but it's the yun, the long aftertaste that will make it truly exceptional. Could this be generalized to (all) other tea kinds? Personally, I think so. Vous avez disposé votre matériel et préparé vos ingrédients, vous êtes donc prêt à passer à la préparation du thé. Cela commence par une étape très importante: le préchauffage des ustensiles. Voir cette vidéo. On commence par le gaibei/zhong, puis la cruche et la coupe de thé. L'eau va ensuite dans la petite poubelle. Selon l'épaisseur de la porcelaine cela prend plus ou moins de temps. Dans la vidéo, vous verrez une façon accélérée de préchauffer le couvercle du gaibei. Je consacre tout un article au préchauffage car ce geste a un impact important sur la qualité du thé. Plus la température est élevée dans le gaibei, plus le thé diffusera ses saveurs. Un thé fait sans préchauffage restera muet, monotone. Durant mes premiers cours avec Teaparker, un préchauffage incomplet ou insuffisant expliquait plus de la moitié des thés que nous, étudiants, 'rations'. C'est si important qu'il peut être judicieux de repréchauffer cruche et tasse si elles ont refoidi entre deux infusions éloignées. Cela s'applique tant au gongfu cha en gaibei, qu'en petite ou en grande théière. Suite à quelques expériences sur l'eau du robinet et sur une eau pure, je confirme que le charbon de bambou a des effets positifs sur la qualité, et donc le goût, de l'eau. Les mauvaises odeurs de mon eau courante furent considérablement réduites, sans disparaitre complètement toutefois. Elle devint plus douce également. L'eau pure, de son côté, reprit vie avec un petit peu d'effet sur ma langue et un goût plus agréable. Quant au thé (un oolong léger) fait avec une telle eau, je n'y trouvai rien à redire. Le mieux serait de voir comment ce charbon actif de bambou peut améliorer et chinoiser les eaux occidentales. Au vu de mes premiers essais, le résultat pourrait être très intéressant et améliorer grandement le goût de vos thés fins. Comme j'ai acheté plusieurs paquets, je propose de fournir 2 morceaux de charbon de bambou GRATUITEMENT avec chaque commande, dans la limite de mon stock. J'ajoute encore une petite condition: de m'informer par e-mail ou par commentaire sur le blog de vos résultats. Passons maintenant aux instructions pour se servir du charbon de bambou. 1. La préparation: Laver les morceaux de charbons que vous comptez utiliser prochainement à l'eau clair, sans savon ou produit chimique. Puis, faites-les bouillir doucement dans de l'eau pendant 10 minutes. Sortez-les de l'eau chaude et séchez-les. Le charbon est maintenant activé et ses propriétés de filtre (air, eau) commencent à agir. Gardez-les dans un bocal fermé lorsque vous ne vous en servez pas. Trempez un ou deux morceaux de charbon actif par litre d'eau pendant au moins deux heures jusqu'à 12 heures ou plus. (Il faudra chercher le bon équilibre entre assez longtemps pour bien filtrer et pas trop longtemps pour ne pas avoir trop de minéraux et donc une eau lourde). Vous pouvez aussi mettre le charbon dans l'eau que vous faites bouillir. La chaleur accélère le processus. Conseil: Faites vos essais avec des eaux différentes, mais, en théorie, vous obtiendrez des meilleurs résultats avec des eaux peu minéralisées au départ. Le charbon peut être réutilisé pendant 2 à 3 mois, mais doit être conservé au sec et dans un bocal fermé pour le faire durer plus longtemps. 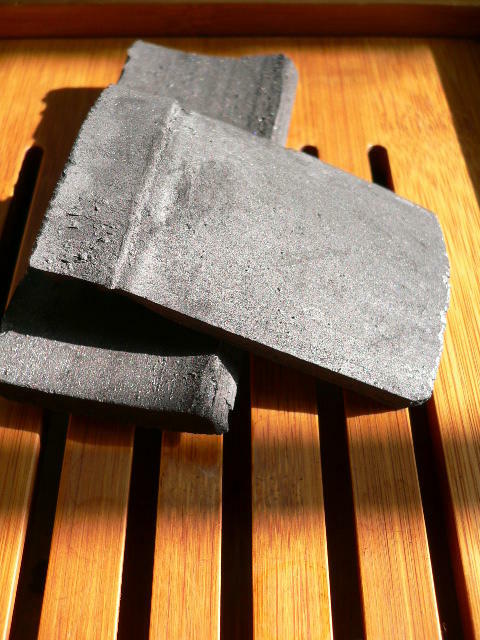 Complètement biodégradable, le charbon de bambou peut être réduit en pour en faire de l'engrais. - Filtre à air pour le frigo, la salle de bains, la voiture, l'armoire à thé! J'ai pris les 2 photos que vous voyez sur mon plateau de thé, en bambou également. 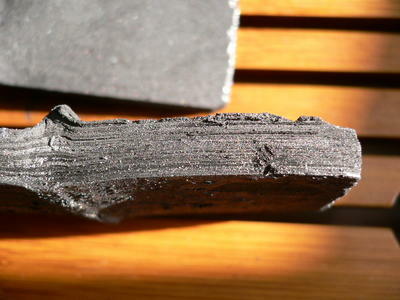 On voit bien que ce charbon est du bambou à l'origine, grâce à la séparation horizontale. J'en ai déjà plongé 4 morceaux dans de l'eau bouillante pour les laver/stériliser/activer. Ils ont séché très vite et deux sont déjà plongés dans une carafe avec de l'eau froide du robinet pour un premier test. Je garde les deux autres pour faire un test avec de l'eau portée à ébulition, ce soir. A bientôt pour les résultats! 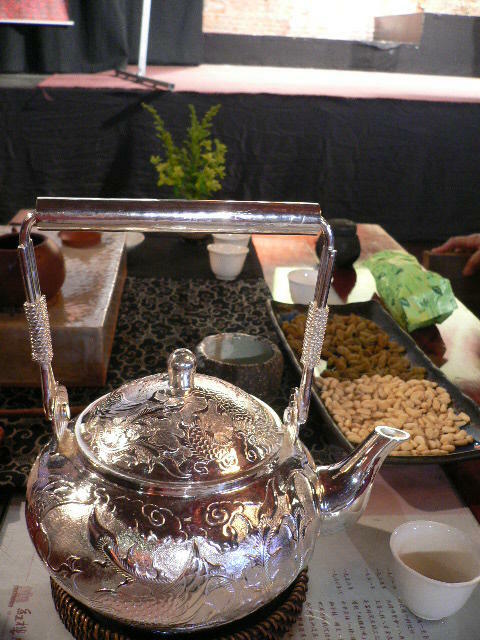 Last Sunday, Teaparker had promised to let us taste an old Taiwanese tea from the Japan colonial rule era (pre 1945). It would have come at the right time as Monday Taiwan celebrated its National Day (October 10). I think he must have forgotten about it (like the other students, by the way) and didn't have the tea with him. however, he did prepare a special treat for us: this special Yi-Bang Mountain Pu-er. It comes from the same region as the best pu-er I had tasted so far. Let's assume the bing weighs 500 grams. That means that the 2.5 grams approximately we drank cost 32 USD. This is equivalent to a very good, but not exceptional, bottle of wine. We were 5 to taste and lavish praise upon it. So this pleasure cost 7 USD per person (a ticket in a movie theater). So, this may well be the cheapest form of luxury, after all! I had the honor, but also the responsibility, to make the tea. I did my best to remain calm. A nervous flow of water would adversely affect this fine tea. I was also concerned that the water was not hot enough. For pu er, the water flow that enters the pot in the first brew must be of medium strength and hit the leaves directly. Teaparker recommeded I don't use a pitcher, but that I should pour directly from the silver teapot into the cups. This allows the tea to be warmer. As I drank my first sip, I first thought that I had 'fumbled' my brew. It slipped down my throat like water. I was about to apologize to the group, but then felt the mellow, delicate but strong yun come out and fill my mouth and throat with their perfection. Not any hint of astringency or any bad taste. Pu-er perfection. Teaparker even complimented me on the brewing. The next 2 brews were also great (sorry I didn't take more precise tasting notes, but this was a moment to enjoy, not one to study). Then Teaparker brewed the tea himself and it got even better! In my first entry about this subject, I mentioned Teaparker's trick: looking at the bamboo wrapper and see if it looks as old as the puer is supposed to be. 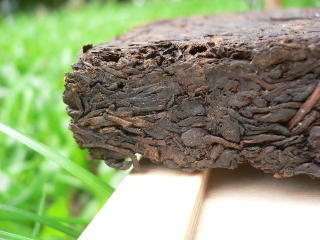 Today, I see that Teaparker has posted the picture I mentioned of a 100 year old puer bing in its original bamboo leave. Compare it with the other young bamboo leaves and you'll see a big difference. 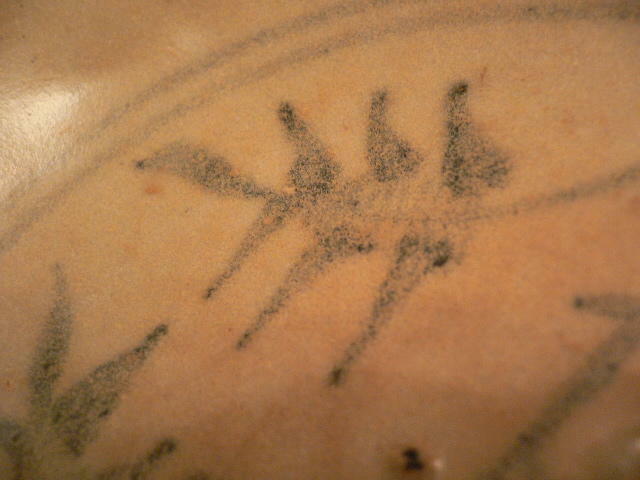 Now, when I brew old or very fine tea in a teapot, I use what in reality is a Yuan dynasty (1277-1367) plate under the teapot. Its beauty, its age, the tea (and some ancient Chinese music) are turning my tea tastings into a little paradise on earth. Not so crazy, after all! Suite à quelques questions d'un lecteur: quel pu-er mettre dans la jarre? Peut-on y mettre une brique sans la casser? combien peut-on mettre dedans? je vais essayer de donner plus de précisions. 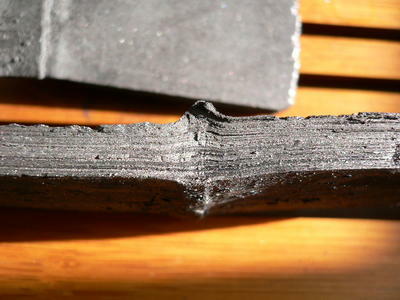 La meilleure façon de bonifier le pu-er pressé sur le très long terme, c'est de simplement le laisser dans son emballage d'origine, dans sa forme comprimée, dans un lieu sans mauvaises odeurs et sans trop de ventilation. Point besoin de jarre. Sur le court et moyen terme (disons de quelques jours à 2 ans), le vieux pu-er pressé se bonifiera mieux en jarre. Ce que j'entends par le mettre dans la jarre, c'est de le mettre décortiqué dedans. L'ouverture n'est pas asssez grande. En effet, durant son vieillissement, certaines odeurs lourdes se sont développées dans le thé et le mieux c'est qu'il s'aère un peu grâce aux pores de la glaise d'Yixing. (Un peu comme la décantation des vieux vins). Pour les puers crus jeunes, la jarre n'est pas tellement nécessaire, car on les boit aussi pour leur jeunesse et leurs notes fraiches. Il n'est pas nécessaire d'aérer longtemps ces puers. Pour les puers cuits jeunes, par contre, une jarre permettra de les affiner plus rapidement encore et est donc très recommandée. La jarre est alors idéale pour les conserver pour les vieillir dans les meilleures conditions. Teaparker dit que la forme et la taille influent aussi sur le vieillissement. J'ai remarqué qu'il vaut mieux que le thé remplisse bien la jarre afin que l'odeur des feuilles se concentre et forme un bouclier contre les odeurs externes. Evaluez combien vous allez mettre dedans pour faire votre choix. 4. Combien peut-on mettre dedans? Difficile à dire. Cela dépend du degré de compression des feuilles, du décorticage... Ca sera à vous d'essayer. Remplissez au fur à mesure que vous décortiquez. Ainsi, si tout ne rentre pas, le reste sera encore sous forme pressée et facile à conserver. A la réception, passez un chiffon sec à l'intérieur et à l'extérieur. C'est tout. Attention à ce qu'elle n'absorbe pas d'eau, sinon il faut la sécher au soleil. 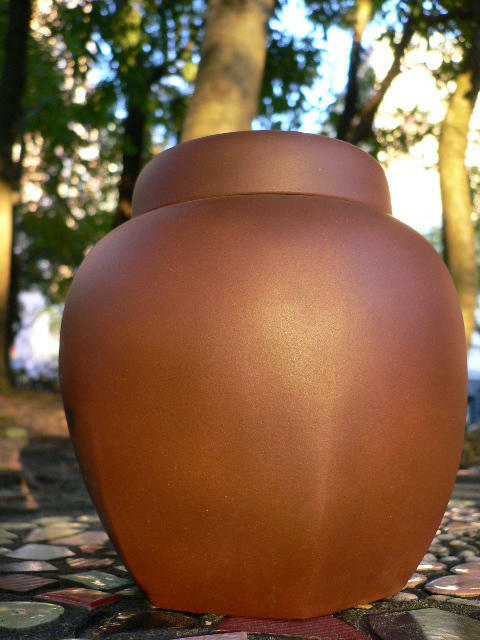 This week, I bought this yixing purple sand clay jar (15 cm high, 560 gram, baked at over 1200 degrees) from the same producer who made the zhuni teapots. He's a good friend of Teaparker, which helped me to get introduced. He is also a major player in the fine Chinese tea market. His basement looks like a museum. 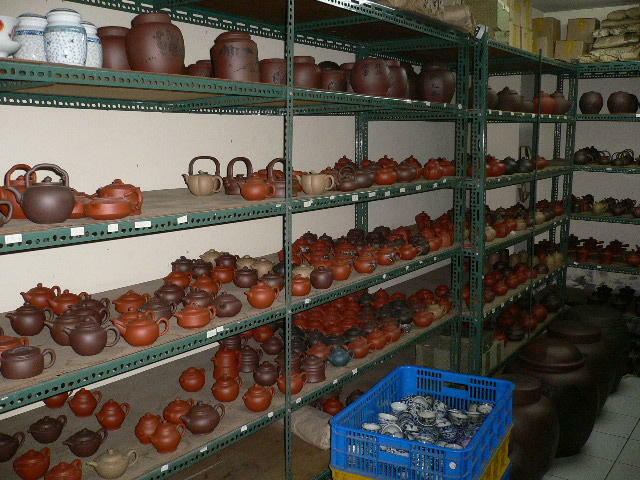 Half of the shelves are not his own products, but ancient potteries he's collecting! Song, Tang, Yuan dynasty... He says many of his guests spend hours going through his collection. I can't wait to go there again!. 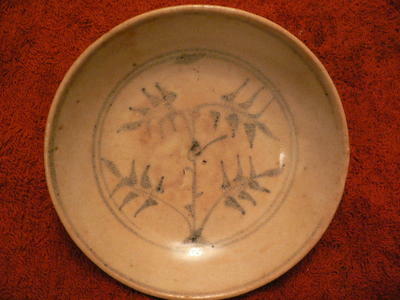 No wonder his works are of such classical and simple Chinese design! 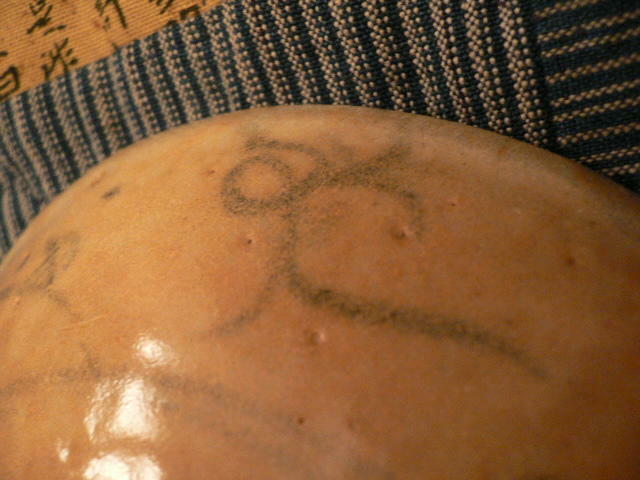 This one has only the word 'Cha' carved on top. But others with calligraphy and paintings (see post below) are also available. I bought this jar for my flaked Jiang Cheng puer. It will help improve it further. Old teas need a little air and humidity coming through the pores of the yixing clay to continue their postfermentation at a slow pace. And for pressed puer it is even more important. It needs to be flaked in advance of brewing. If not, you may get some off flavors that were trapped inside the tea and that didn't have time to go away. Le même fabricant que la théière en zhuni (et ami personnel de Teaparker) fabrique aussi de superbes jarres en glaises pourpre d'Yixing qui permettent aux vieux thés (dont les puers) de respirer à travers les pores de la glaise et donc de continuer à se bonifier. Elle ne convient donc pas aux thés verts et oolongs jeunes qu'on boit pour leur fraicheur et leur jeunesse. Pour ces thés là, des jarres en pocelaine laquée ou bien en métal sont plus indiquées. Je pense donc dorénavant proposer mon vieux baozhong dans cette jarre de 10 cm de haut pour un poids de 240 gr et a été cuite à plus de 1200 degrés. Elle existe aussi une taille plus grande dans cette même forme, mais avec d'autres motifs toujours aussi chinois. On en trouve aussi dans d'autres formes. 1. Le thé: tous les thés peuvent être préparés avec les principes du gong fu cha. On privilégiera bien sur les thés chinois de haute qualité, sans ajouts d'huiles parfumées. Mais on pourrait même faire du thé en sachet avec cette méthode et obtenir un meilleur résultat que d'habitude. Voilà donc le but du gongfu cha: infuser le thé de manière à obtenir la meilleure coupe de thé possible. 2. L'eau: Teaparker dit que c'est la mère du thé car elle le compose à 99%. Il convient donc de la choisir avec grand soin. En France, j'utilise souvent Volvic (aucun lien) ou bien des eaux très peu minéralisées. A Taiwan, pour les grandes occasions, j'utilise de l'eau de source de montagne que je cherche chaque année le jour de la fête des bateaux dragon entre 11h et 13h. Une eau filtrée a aussi des chances d'être bonne, mais le mieux reste de faire une dégustation de plusieurs eaux qui vous sont accessibles à température ambiante et de retenir celle qui glisse le plus facilement et a un goût un peu moelleux. 3. Le feu: La chaleur permet aux feuilles de diffuser plus rapidement leurs saveurs. Un thé infusé à 100 degrés Celcius au lieu de 80 degrés est deux fois plus concentré. C'est pour cette raison que Lu Yu et Teaparker recommandent de toujours utiliser une eau qui a atteint le point d'ébullition. Et mieux vaut ne pas l'atteindre trop vite car il devient alors difficile de repérer quand leau est prête: quand se forment des bulles de la taille d'un oeil de crabe. Passé le point où les bulles ont la taille d'un oeil de poisson, l'eau 'vieillit' et perd de sa fraicheur. Remember how I advised choosing the color of your bowl depending on the tea you brew? My purpose was to verify Lu Yu's study that this kind of green color will show green tea in all its splendor. 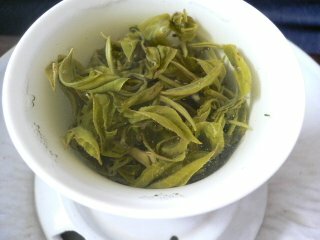 For that, I brewed some post Qing Min Jie Bi Lo Chun 2005 and the result needs no further comment. Just compare with the color in both cups. Lu Yu, thank you! You're the greatest! C'est là que je me suis rendu hier soir. Il s'agit d'un bon ami de mon professeur de thé. Il a une cave remplie de trésors. Sur cette photo, vous voyez à peine un dixième de ce que j'ai pu voir. 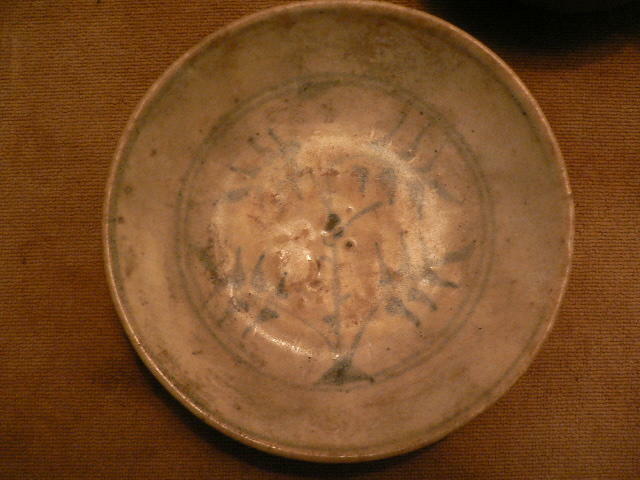 J'ai craqué pour de nombreux objets forts utiles: des pots en glaise pour conserver le vieux thé ou le puer (en haut), de jolies coupes vertes, et bien sur ses théières zhuni (voir mon autre post de ce jour et de vendredi dernier). Je vous montrerai mes acquisitions en plus grand détail quand je les aurai bien photographiées. - 'Song dynasty' spring 2005 2nd grade Dan Chong. I had never tried these Mainland teas before. The smells of the dry leaves reminded me of black and milk chocolate, respectively! This made me real curious. 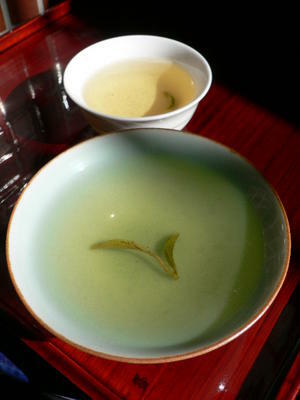 * The Liu An, a black tea, will turn more and more green after each infusion. It reminded me of an old green tea I drank with Teaparker in the park of the Taida university 2 years ago. * The Dan Chong still has many secrets to uncover for me. The chocolate smell turned to mandarine (a french word for a kind of small orange that's easy to peel). 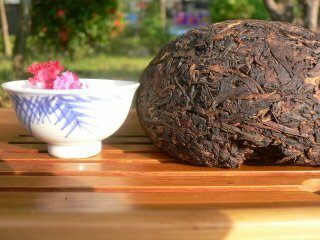 Not a tea everybody will like, but those with a taste for puer should find it interesting. 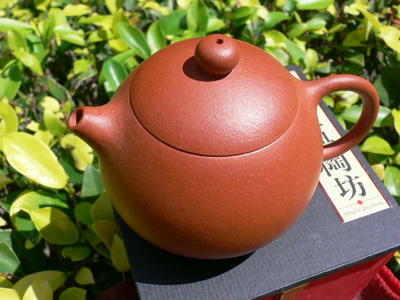 Same material and same producer as the zhuni teapot I showed last Friday. However, this one comes plain and a little bit smaller: 95 grams for 15 cl volume. Baked at 1270 degrees. "En France, le thé est devenu à la mode depuis quelques années, pas le savoir-faire ! (...) Je trouve votre blog extrêmement intéressant, une mine d’or au niveau information. Une chose lui manque pour devenir « LE blog des blogs sur le thé» : une page, accessible depuis l’accueil, où vous nous présenteriez les diverses façons de réussir un « bon »thé (tel type de thé = telle méthode, ou telle méthode pour les thés X, Y & Z…). Par méthode, je sous-entends les accessoires nécessaires, et la technique appropriée. Au vu de la qualité des photos que vous nous faites partager, cela deviendrait un Must incontournable, à tout le moins une bible de référence pour les néophytes comme moi (et des milliers d’autres). Quand on manque cruellement d’expérience, lire le test d’un vieux pu er met l’eau à la bouche, mais ne sachant pas bien comment le préparer (et d’une certaine façon le respecter), on a un peu l’impression d’être devant une merveilleuse vitrine, sans savoir comment entrer dans la boutique… ! Et je connais pas mal de gens, amateurs de thé, qui ignorants comme moi, hésitent à investir dans des ustensiles dont ils ne maîtriseraient pas (ou mal) l’usage." - A droite: un gaibei (ou zhong, ou gaiwan) avec sa soucoupe. Cette soucoupe peut servir pour présenter le thé aux invités, afin qu'ils le sentent sans le toucher. - A gauche: une petite cruche. Une fois le thé déversé dans les tasses, on peut sentir l'odeur de la cruche vide. - Devant: une petite tasse de thé (en prévoir plusieurs si vous ne buvez pas seul). - En dessous: une jolie serviette de couleur foncée (le thé tache) et absorbante. Elle servira à recueillir l'eau qui ne manque pas de s'écouler sur la table durant les manipulations. - un grand pot poubelle pour y jetter l'eau et les feuilles usagée. 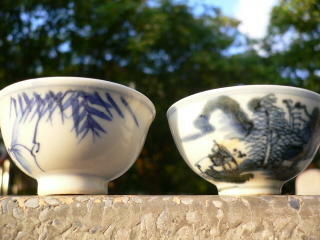 Here are 2 of my old tea cups. You can see it at their imperfection. The one on the right still has some earth stain that won't go away. Such old cups with an antique teapot (see below) are not essential to drink old tea, but they create harmony between the tea and the accessories that may open a door to the past during the tasting. The tea has a taste of old, the teaware feels and looks old. 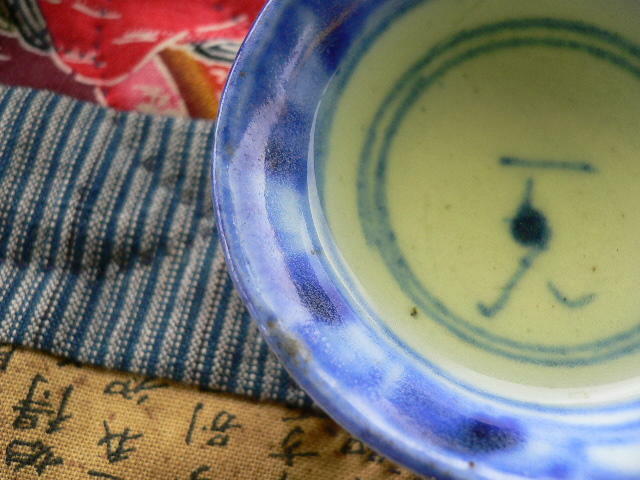 You then feel connected to centuries of Chinese tea traditions. As I said, the teapot does not have to be antique. 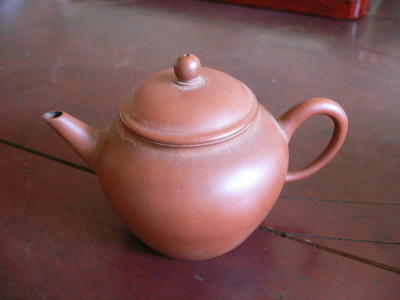 A new one with a very classic, simple shape like my zhu ni teapot (2 posts below) or this one. Using old or classic accessories is like dressing up for church. You are showing respect and a willingness to enter in the right mood. Mon petit concours pour trouver les meilleures combinaisons thé et plats européens est clos. Le bonheur (Le) est dans (ze) le thé (cha). C'est aussi un jeu de mot avec mon nom de famille traduit en "Le" en chinois pour des raisons phonétiques. Ainsi, cela pourrait aussi signifier que mon nom de famille baigne dans le thé! Ce premier prix revient à Sophie (de lannion) pour ces nombreux commentaires et notamment pour son étude de l'accord fromage et thé. Grand bravo! Les 4 prochains prix sont des échantillons de ma brique de puer sauvage de Jiang Cheng de 1990. Merci pour votre participation! Le concours est terminé, mais n'hésitez pas à continuer à me faire pavenir vos commentaires si vous deviez découvrir un très bonne combinaison thé et repas.